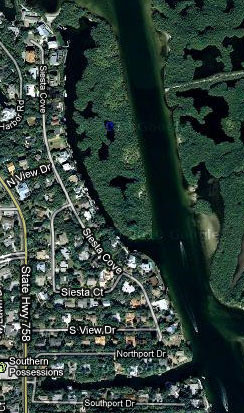 Siesta Cove is the Siesta Key development located just south of Hidden Harbor. Siesta Cove features many waterfront homes on the Intracoastal Waterway. Many of these waterfront residences are shielded from the noise of passing boats by a large Mangrove Island that separates the home sites from the ICW. The waterfront residences offer deep water dockage for large sailing and fishing watercraft. The 83 homes in the community were built in the 1970s and 1980s. Many of the original waterfront homes that were built in the community have been raised to make way for the palatial mansions that exist today. You will find lush tropical landscaping, exotic trees, beautiful birds, and cool gulf breezes within the boundaries of this community. Architectural styles of the Siesta Cove homes for sale includes Mediterranean, Contemporary, Florida Ranch, and “Key West Style” homes. Prices for the homes vary greatly from $500,000 to $5 million for the opulent waterside residences. Square footage for these homes is also quite variable. Homes as small as 1,500 square feet can be found as well as residences that top 6,000. The #2 beach in the US is located just blocks away and Siesta Key Village is a 5 minute drive from the driveways of these homes. The best things about Siesta Cove are the quiet atmosphere, fantastic central location, easy water access, attractive prices, and friendly neighbors. Living on Siesta Key and within a neighborhood like Siesta Cove certainly is living in Paradise. The HOA fees run approximately $300 per year which is a huge savings over comparable homes found on the mainland. If you are looking for a premier Siesta Key neighborhood at an affordable price, Siesta Cove offers some of the best values on the island. Below are all of the current real Estate listings available for Sale in Siesta Cove as of 6AM this morning.